Geelong is a vibrant city that embraces events. From summer music festivals to winter markets, food and wine festivals and cultural or sporting events, there is something for everyone. We start the year with the Festival of Sails, bringing the Geelong Waterfront to life with sailing and festive activities on the Australia Day weekend. We dance through the Labour Day long weekend at Motor City Music Festival. The National Celtic Festival in in Portarlingtgon in June. October is for foodies, with Extravaganza gourmet showcase followed by Toast To The Coast wine festival on Melbourne Cup weekend. Throughout the year there's sport, culture, arts, entertainment, music, kids stuff and a whole bunch more. There are so many activities that we can only show some of the main ones here. To keep up to date with what is happening in Geelong and on The Bellarine, visit the Events Geelong website here. Whatever genre of music you like, local radio stations Krock and BayFM will keep you up to date with what is happening and where to find the in-crowd. The Wool Exchange Entertainment Complex is one of Geelong’s most popular venues showcasing smaller indie bands and more established groups. See the latest released movies at Village Cinemas in the CBD or Readings Cinemas in Waurn Ponds or experience movies from around the globe at The Pivotonian Cinema in South Geelong. Queenscliff is home to the world's only Blues Train combining live acts and the beautiful scenery of the Bellarine while aboard a moving heritage train. If you are looking for more of an active adventure we've got that too! As Victoria's second largest city we have so many shopping options from Westfield and Market Square in the CBD with major department stores and chains, as well as a good mix of specialty shops and independent boutiques. Little more than five minutes by car from the CBD you will find bustling shopping precincts in Geelong West, Belmont, Waurn Ponds and East Geelong. There is so much on offer from malls to speciality stores. One of our favourites is the cosmopolitan Pakington Street which connects Geelong West with Newtown. This is a great place to explore and is known by locals as 'Pako'. There are many boutique shops and cafes, international cuisine, bars and so much more. So so many options! Where to begin! Whether it be a quick bite, a group celebration or a formal occasion, there's plenty of choices in the city and the surrounding suburbs, precincts and regions. On the run and need to get to class? Don't worry as there are plenty of places to get quick, wholesome food. Eclectic, quirky, cheerful are all perfectly adapt adjectives to describe some of the local cafes. Geelong has better-than-average coffee and loads of venues that take advantage of our position on the coast to offer views, al fresco and an amazing range of local produce. The waterfront in Geelong caters to every possible taste or fancy. For the young there is ice-cream, for the hungry there is pizza or fish & chips (an old time Aussie favourite), for the party goers, there are restaurants and bars overlooking the sea! Start by checking out he city’s cultural precinct around Little Malop Street. See what is on at GPAC (the Geelong Performing Arts Centre) or CourtHouse Arts and learn about local artists and performers, mainstream or otherwise. Across the road, The Geelong Gallery is home to a magnificent collection of 19th and 20th century Australian and European paintings and decorative arts. From there visit the Geelong Regional Library, an iconic state-of-the-art facility with views over the city. Next take take a stroll through the picturesque Jonhstone Park to the National Wool Museum in Moorabool St with its timeless Australian story of wool, combined with exciting contemporary exhibitions, presented in an historic bluestone woolstore. 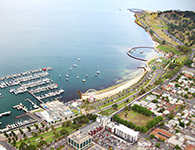 Head towards the Waterfront and make your way along the Geelong Waterfront Bollard Trail. The Bollards represent historical members of the city made from reclaimed timber pier pylons and painted by artist Jan Mitchell. Walk through history along the Bollard Trail from Limeburner’s Point to Rippleside Park. Stop along the way and experience the old world charm of the beautifully restored Geelong Carousel and meander to the early century beach promenade at Eastern Beach. But that's just the start! Take a trip to The Bellarine where you will find art galleries and museums or visit Steiglitz Historic Park where you can enjoy a pleasant bushwalk, relax with a picnic or pan for gold. The Steiglitz Court House, with its display of photographs, maps and relics of gold year is open Sundays and public holidays. Geelong is well known for its cultural diversity as many of our residents have an international background. There are more than 51 cultural communities registered with Diversitat (not-for-profit community service organisation) within the Geelong region and many of them coordinate social events and cultural activities, not only for their communities, but for people who are interested in learning more about different cultures. For instance, the Italian Club organises dance nights, the Spanish Community at Hope Centre offers Flamenco classes for all levels weekly, the Brazilian Community, ABRISA, conducts social events and Portuguese lessons and The Indian Social Club teaches Indian Dance Forms in The Mudra Academy of Dance. Wherever you come from, you will feel welcome in Geelong. A part of what makes Geelong a great place to live in is the willingness of people to get involved in community groups and activities. Whether it be a sporting club, a service club, an arts group or cultural organisation, there are many ways to get involved in the community, have some fun and make friends too. Information about community organisations, groups, clubs, services and associations and based in the City of Greater Geelong can be found here. Australia is a sporting nation. You will quickly find out that everyone is passionate about AFL Footy and the Geelong Cats is our local team. Their impressive stadium can be seen from all over Geelong. For a true Australian experience make sure that you go along to one of the home games at Simonds Stadium.The 2017 AFL season gets underway in April. But don't just watch footy! How about playing it yourself. Find your local club here. Maybe it's cricket, soccer, tennis, swimming, hockey, volleyball, sailing or baseball you are interested in. Geelong has a wide range of sporting options. In fact there are over 600 sporting clubs, which not only provide the opportunity for recreation, but you can make local friends too! Find a local sporting club here.